This book blew my mind with the concept of dehydrating your toothpaste to save weight. I have decided to get more serious by (slowing) putting together a Bug Out Bag. Which is why I blogged about the "Build the Perfect Bug Out Bag" by Creek Stewart a few weeks ago. 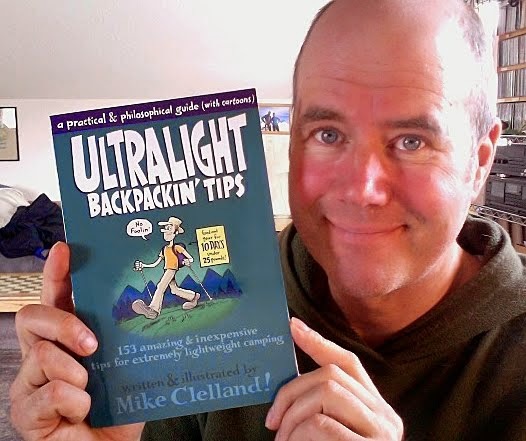 Well I stumbled upon this book by Mike Clelland and it has led me into the nerdy, obsessive sub-culture of ultralight backpacking. We are talking about people who take the lightest packs possible while out hiking. To qualify as ultralight your backpack base weight must be below 10 pounds which is about 4.5 kg. While "base weight" does not include the weight of consumables, like water, food or fuel, it is pretty impressive. And there is even sub-ultralight backpacking when you get below 5 pounds! Obviously Mike's tips could be helpful for making your Bug Out Bag lighter. And a lighter bag means you can outrun zombies better. But to be honest, the real reason I bought this book is because Mike is an illustrator and his cartoons are brilliant. The big thing Mike teaches is how to scrutinise every single item you pack. Survivalist would say you need 3 or 4 ways to make fire. Yet Mike carries a single mini-Bic lighter and his backup is a book of match in a zip-lock bag. He doesn't even carry a knife, just a single sided razor blade. Mike also provides some handy camping tips that could be very useful in a zombie apocalypse. For example, he doesn't use toilet paper and his detailed instructions of using natural materials, like pine-cones, as a substitute are a must read. The accompanying cartoons are a delight. Another gem is his recipes. He is a vegetarian and packs a lot of flavour into his "groovy-biotic" food. My own attempts at dehydrated meals have been, um, rather disappointing. So I am keen to try out his recipes, like his instant mash potato dish nicknamed the "Spud Bomb". Which he cooks using a home made alcohol stove (an empty cat food tin with holes punched in it). Overall an educational and entertaining read. In case you are wondering, that is Mike Clelland in the photo, not me. I have more hair. Bite off more "Spud Bomb" than you can chew.